Fig. A-243. Todd-AO Synchronizer, 1-picture by 1-sound, with footage counter only. These synchronizing machines provide for synchronizing picture film with a variety of sound film. Since in the Todd-AO Process the picture film travels at a different rate of speed than the sound film, these machines are designed so that 100 perforations of picture film pass the index point while 64 perforations of sound film pass this point. They can accommodate either the 65mm or the 70mm Todd-AO film and standard 35mm sound film. They are provided with a disconnect between the picture and sound sprockets so that the two can be phased at any step in the operation. The footage counters measure feet of sound film, 64 perforations corresponding to 100 perforations of picture film. Fig. A-242. Todd-AO Synchronizer, 1-picture by 1-sound, front view. This latter 100 perforation unit of length has been given the coined term of the "Gleep". Therefore, the running time of a foot of sound film and a gleep of picture film is the same. For use in music editing, some of the synchronizing machines are provided with running time counters, reading in seconds, as well as the footage counters. These running time counters read to individual picture frames of 1/30 second. Fig. A-224. Side view Todd-AO Synchronizer, 1-picture by 2-sound. Frame lines are marked and numbered for their respective number of perforations on both the picture and sound sprockets. Fig. A-241. Left side view of Todd-AO Synchronizer, 1-picture by 2-sound, with footage counter only. Fig. A-225. Front view of Todd-AO Synchronizer, 1-picture by 2-sound with footage counter only. Fig. B-39. Todd-AO Synchronizer, 1-picture by 4-sound with footage counter only. Fig. A-229. Todd-AO Synchronizer, 2-picture only for synchronizing workprint and cut negative. Fig. A-227. Side view of Todd-AO Synchronizer, 2-picture. Fig. B-35. Side view of Todd-AO Synchronizer, 1-picture by 2-sound with both footage counter and a running time counter. Fig. B-38. Front view of Todd-AO Synchronizer, 1-picture by 2-sound with both footage counter and a running time counter. Fig. B-40. Side view of Todd-AO Synchronizer, 1-picture by 4-sound with both footage counter and a running time counter. Fig. B-36. Front view of Todd-AO Synchronizer, 1-picture by 4-sound with both footage counter and a running time counter. Fig. B-33. Side view of Todd-AO Synchronizer, 1-picture by 6-sound with both footage counter and a running time counter. Fig. B-34. Front view of Todd-AO Synchronizer, 1-picture by 6-sound with both footage counter and a running time counter. Fig. A-240. Todd-AO Synchronizer, 2-picture by 4-sound with footage counter only, shown mounted on a synchronizing bench with the Todd-AO Synchronizing Bench Rewinds designed to take multiple film reels. 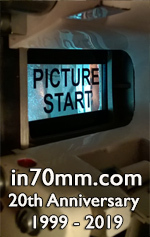 One picture / one sound sync machine with film loaded on the picture sprocket. Sync machines were available with up to six sound film sprockets. Fig. A-300. Overall view of the Todd-AO Edge Numbering Machine, showing the supply and take up reels, the numbering section and the drying loops. The Todd-AO Film Edge Numbering Machines are designed to number Todd-AO film every "gleep" or at 100 perforation intervals, corresponding to the running time of one foot of sound film. The numbers appear between the perforations so that they are not obscured by magnetic sound striping outboard of the perforations. Fig. A-297. Close-up of the numbering section of the Todd-AO Edge Numbering Machine. Fig. A-299. Close-up of the special gear box on the Todd-AO Edge Numbering Machine with the eccentric gears to give speed match of numbering block and film.